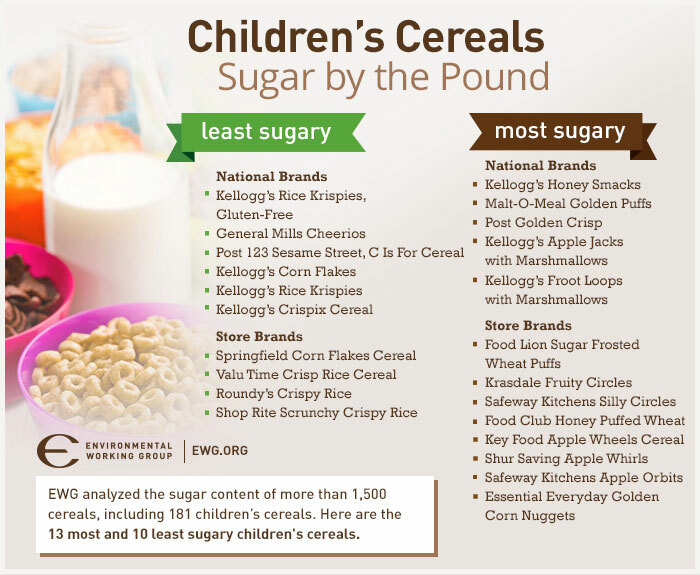 EWG’s analysis of more than 1,500 cereals, including more than 180 children’s cereals, shows that a child who eats a bowl a day for a year ends up consuming 10 pounds of sugar. Moreover, the cereals loaded with the most added sugar frequently come in packaging that features cartoon characters to appeal to kids. A single serving can contain nearly as much sugar as three Chips Ahoy! cookies, and more than two Keebler Fudge Stripe cookies. And because the serving sizes listed on many cereal boxes are unrealistically small, even sugar-conscious consumers are eating even more than they realize. To top it all off, 11 of the 13 most heavily sugared children’s cereals feature marketing claims like “Good Source of Fiber” that suggest misleadingly that the products are healthful. So how do you navigate the cereal aisle to find the least sugary products? Check these lists to see which have the most and the least sugar before you head to the store. In all, EWG researchers ranked more than 1,500 cereals by their total sugar content by weight and compared the findings with guidelines issued by federal health agencies and other organizations. Twelve that are more than 50 percent sugar got nominated to EWG’s cereals “Hall of Shame.” The list includes Kellogg’s Honey Smacks, Malt-O-Meal Golden Puffs and Post Golden Crisp. EWG also took a second look at 84 popular children’s cereals it had previously analyzed in its 2011 Sugar in Children’s Cereals report. It found that not one on the 2011 “worst” list had lowered its sugar content over the last three years. The new report includes tips for any cereal eater who wants to cut back on sugar, including paying attention to the nutrition labels to find out which products are the least sugary. 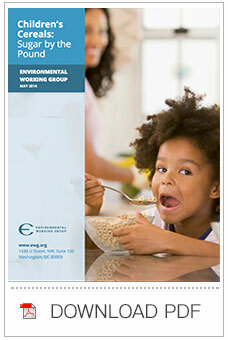 EWG recommends no more than a teaspoon (4 grams) per serving. Preparing breakfast from scratch and eating fruit, unsweetened hot cereals or other whole foods with no added sugar are smarter choices. Ready to start shopping and eating healthier? Looking for better food at a lower cost? EWG’s Good Food on a Tight Budget is filled with 100 hand-picked foods that pack in nutrients at a good price, with the fewest pesticides, contaminates and artificial ingredients. 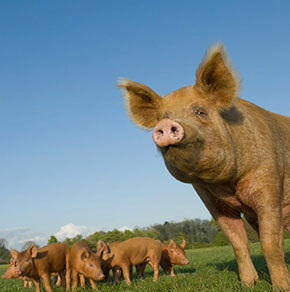 Concerned about pesticides in your food? 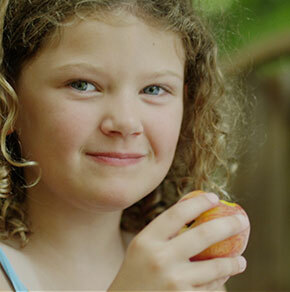 Check out EWG’s Shopper’s Guide to Pesticides in Produce to see which fruits and vegetables have the highest and lowest pesticide residues. Want to eat healthier and greener? EWG’s Meat Eater’s Guide to Climate Change + Health will tell you which foods are the best – and worst – for our health and the planet.